Join us at the Safari Park for the May meeting, picnic, and silent auction. You should have already RSVP'ed for the event so we will have an accurate count for tables and chairs and have the correct number of Safari Park admittance for those without a zoo membership or pavilion volunteer badge. Pick up your Safari Park pass during the spring show at the membership table or from 'Lyn Stevenson. 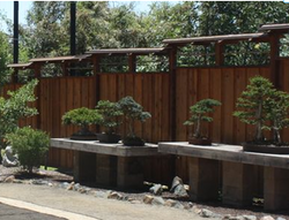 This May is the 5th Anniversary of our new Bonsai Pavilion. Curator John Jackson, Assistant Curator Dennis Wagner as well as the Pavilion volunteers have been diligently working on trees that will also be in the auction due to the inventory of the collection. We keep and improve almost all the bonsai but sometimes we have extra, "almost duplicates". There will be mixes and pots available along with all the treasures that members bring in to donate to the silent auction. For those members requesting shuttle: After entering the Safari Park's front gate, proceed to the Ranger Station/Administration Building (near the large restroom area) and ask for the cart to take you to the Bonsai Pavilion function. Bonsai Pavilion volunteers will be in the Bonsai Pavilion for guided tours of the collection and work area. They will have their red Safari Park shirts and name tags so all SDBC members and guests can identify them.